Community and public foundations play an important role in the health of Montana’s nonprofit ecosystem – contributing nearly $10 million to the state in 2012. This represented a 56% increase over community and public foundation giving in 2010. Despite these gains, overall giving to the state was down by $21 million. This trend was predominantly driven by a 72% decline in support to environmental initiatives (-$13 million) by funders outside of the state. Montana typically has a comparatively high proportion of funds allocated to environment and animal-related issues. In 2012, over $6 million (19% of all state funds) was contributed to the category. 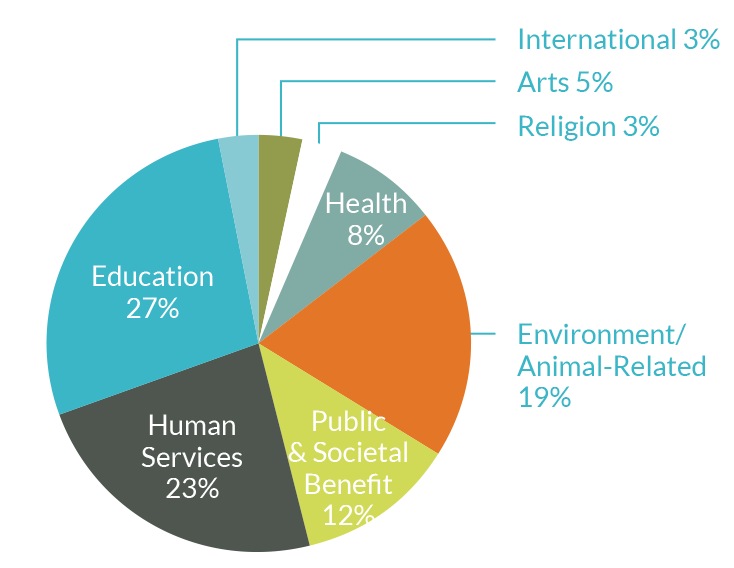 It’s also important to note that 50% of all giving within the human services category ($3.7 million) went to recreation initiatives that also had environmental conservation priorities. Distributions from the Whitefish Community Foundation for trail easements accounted for a significant portion of this finding.